The PELCO® FIB lift-out TEM Grids have been designed for in-situ lift to attach the TEM lamellae milled out by SEM/FIB or FIB systems. The design has been optimised for access and flexibility. The nominal diameter of the sturdy PELCO® FIB lift-out grids is 3mm. These grids fit all standard TEM holders and provide a full view of the thin section attached to the posts. The typical thickness of the copper lift-out grids is 35µm /-5µm. The Cu FIB lift-out grids also have a thinner ridge on the inside, where the lamella can be attached and are protected when stored. Available with either one or two wider v-shaped posts or four narrow flat posts. An identification number is etched into the grid. Use single or dual wide posts for attaching a single lamella or the four posts for attaching a larger number of lamellae. Size of wide post is 250 x 35 x 190µm (W x D x H), size of narrow post is 80 x 35 x 190µm (W x D x H). The typical thickness for the molybdenum lift-out grids is 50µm +/-5µm. Use Mo where Cu is not suitable. Only available with two wide posts. Size of wide post is 250 x 50 x 190µm (W x D x H). The thickness of the silicon lift-out grids is 100µm which makes them compatible with all standard TEM holders. Perfect half circular shape which fits nicely in the TEM grid holder. Debris-free, metal-free lift-out grids which readily bond with Pt to attach the lamellae. Straight edges, similar to the Cu and Mo grids; easy to handle. B-doped, conductive silicon minimises charging during sample preparation and TEM imaging. Available with four narrow posts, which can be shaped if needed. Post size is 80 x 100 x 190µm (W x D x H). The PELCO® FIB lift-out half grid is made of stiff copper beryllium with a thickness of 100µm. Has two dots on one side for easy identification. Diameter 3mm with a height of 1.5mm. Slot is 2mm wide x 0.5mm deep. This robust half grid offers easy handling and good protection for the TEM lamellae. The Omniprobe® lift-out grids are specifically designed to accept the TEM lamellae milled out by FIB or SEM/FIB systems. Typical thickness of the grids is 25-30µm with a diameter of 3mm. The posts are designed for optimum access and provide a secure area for attaching (welding) the lamella(e). The Omniprobe® grids fit standard TEM holders and provide a non-obscured view of the thin sections attached to the posts. Available in standard Cu with 3, 4 and 5 posts and in Mo with 3 and 4 posts. All lift-out grids have multiple indexed mounting positions for easy identification and positioning in the TEM. The main difference between the Omniprobe® FIB lift‐out TEM grids, 3 posts, copper (GF303‐CU3) and the Omniprobe® FIB lift‐out TEM grids, 3 posts, copper, shallow downset (GF303‐CU3SD) is that the (GF303‐CU3) has a sharp edge at the "downset". Because there is a sharp edge rather than a rounded corner, it makes it very easy to see exactly where to place the lamella when mounting to the side of a post. With a rounded corner on the GF303‐CU3SD, placement is more difficult to determine. These two grids are manufactured using different processes. This is the reason the GF303‐CU3 grids are also typically thinner than the GF303‐CU3SD grids. GSB-100 storage box for 100 FIB lift-out grids or storing standard 3mm TEM grids flat. No adhesive in box. 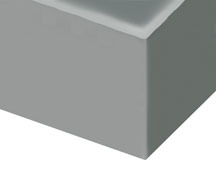 Cavity size is 3.34 x 3.34 x 1.5mm. Complete with lid and clips. Stackable. Overall size is 55 x 51 x 10.7mm. Same internal and external dimensions as standard GSB-100 storage box, but with anti-static tray made of black conductive polypropylene. Complete with polystyrene cover and polypropylene clip. Stackable. Four position grid box with lid for holding FIB lift-out grids or half grids. The PELCO® FIB lift-out grid box cavity depth is only 1.7mm, preventing the grids from rotating in the diamond shaped cavity. The FIB grids can be relatively easily loaded/unloaded using sharp tweezers. The PELCO® silicon aperture frames are 3mm disc type frames with a thickness of 200µm and square or rectangular apertures. They are made with the same clean, state-of-the-art manufacturing techniques as the PELCO® silicon nitride support films. The silicon nitride has been removed, leaving a silicon frame. They are perfectly round, 3mm frames, featuring the Easygrip™ edge for easy handling. 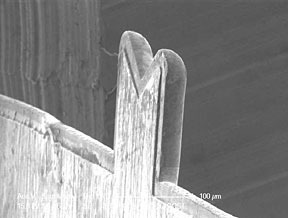 No broken edges and free of debris often associated with other manufacturing processes. Offered with three sizes of openings: 0.5 x 0.5, 1.0 x 1.0 and 1.5 x 0.5mm. Fully compatible will standard 3mm TEM holders. These special low profile pin mounts are available flat, as a 90° mount, and with specific angles ideally suited to accommodate specimens with small working distances in FIB, DualBeam and CrossBeam systems. Made of aluminium. Fully compatible with standard pin stub mounts (pin 3.2mm diameter) for sample storage and transport. These mounts can be used directly in FEI and TESCAN systems with the standard pin length, ZEISS/LEO systems with the short 6mm pin, and with pin adapters in Hitachi and JEOL systems. Low profile flat FIB pin mount, diameter 12.7mm. Low profile flat FIB pin mount with short pin (6mm), for ZEISS/LEO systems. Diameter 12.7mm, total height 7.0mm. Low profile 90° FIB pin mount, diameter 12.7mm. Low profile 90° FIB pin mount with short pin (6mm), for ZEISS/LEO systems. Diameter 12.7mm, total height 9.15mm. Low profile 38° FIB mount for FEI. Diameter 12.7mm. Low profile 36° FIB mount with short pin (6mm) for ZEISS/LEO. Diameter 12.7mm, total height 9.15mm. Low profile 35° FIB mount with short pin (6mm) for TESCAN. Diameter 12.7mm, total height 9.15mm. Simple but effective PELCO® FIB grid holder based on a standard ø12.7mm pin stub. This holder accommodates up to 2 FIB grids of the same thickness. Can also be used to safely store FIB grids with thin sections attached to them. Overall dimensions are ø12.7mm x 7.8mm H without pin. Standard ø3.2mm pin. Material: vacuum grade aluminium with brass screw. Philips screwdriver #0 included. The PELCO® single FIB sample and grid holder holds an FIB sample mounted on a standard 12.7mm pin stub for FIB milling and lift-out procedures. It also holds two FIB grids conveniently close to the sample, to mount prepared TEM lamellae on the FIB grid for subsequent TEM imaging. Compact holder suitable for all FIB/SEM systems which accept pin mount holders, such as the FEI, ZEISS and TESCAN systems. For the JEOL and Hitachi systems a pin mount adapter is needed. Made of vacuum grade aluminium with brass screws. Philips screwdriver #0 included. Overall size is 22.4 x 12.7 x 11.7mm. Standard 3.2mm pin. The PELCO® double FIB sample and grid holder accommodates FIB samples mounted on two standard 12.7mm pin stubs, for FIB milling and lift-out procedures. It also holds two FIB grids of the same thickness conveniently close to the sample, to mount prepared TEM lamellae on the FIB grid for subsequent TEM imaging. Compact holder suitable for all FIB/SEM systems which accept pin mount holders, such as the FEI, ZEISS and TESCAN systems. For the JEOL and Hitachi systems a pin mount adapter is needed. Made of vacuum grade aluminium with brass screws. Philips screwdriver #0 included. Overall size is 36.5 x 12.7 x 11.6mm. Standard 3.2mm pin. These screws are suitable for GF331, GF332 and GF333 grid holders. Larger FIB grid holder capable of holding multiple FIB grids of the same thickness. Can also be used to safely store FIB grids with thin section (lamellae) attached to them. Brass thumbscrews facilitate easy loading and unloading. Overall dimensions 22.5 x 29 x 13.5mm. Standard 3.2mm pin. Material: vacuum grade aluminium with brass thumbscrews. The FIB sample prep and grid holder accommodates an FIB sample mounted on a standard 25mm pin stub for FIB milling and lift out procedures. It also holds FIB grids of the same thickness, to mount the prepared lamellae on an FIB grid for subsequent TEM imaging. Versatile holder suitable for all FIB/SEM systems which accept pin mount holders such as the FEI, Zeiss and TESCAN systems. For the JEOL and Hitachi systems a pin mount adapter is needed. Brass thumbscrews facilitate easy loading and unloading. Overall size is 50 x 29 x 13.5mm. 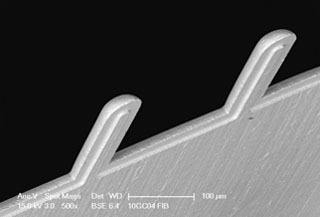 Standard ø3.2mm pin. Material: vacuum grade aluminium with brass screws. The low profile double TEM grid holder holds two lift-out grids and has a spring-loaded jaw for easy unloading. This holder has a short standard pin-style post base: ø3.2 x 4mm length, to accommodate thinner-type stage plates used in full wafer systems. Made of aluminium and all non-magnetic materials. TEM grid and sample holder for FIB and SEM/FIB (DualBeam™ and CrossBeam®) systems with stations for 2 TEM lift-out grids and 2 sample mounts. This holder has a standard pin style post base: ø3.2 x 8.1mm length, compatible with most standard pin stub holders. Made of aluminium and non-magnetic materials. Single sample and TEM grid holder for FIB and SEM/FIB systems, with stations for two TEM lift-out grids and one sample mount. This holder has a standard pin style post base: 3.2 x 8.1mm compatible with most standard pin stub holders. Made of aluminium and non-magnetic materials. Custom probe tip design for the AutoProbe™ 100 & 200 systems. Nickel tube shank with a diameter of 0.508mm and a tungsten tip with a diameter of 76µm. Tip radius is 0.5µm with a 13° taper angle for maximum lifetime. Nickel shank ~33.25mm long. Tungsten tip ~35.5mm with the tungsten whisker starting 2.3mm from the tip. Custom probe tips for the AutoProbe™ 100 and 200 systems. All tungsten design with a tip radius of 0.5µm and a 10-13° taper angle for maximum life time. Shank diameter is 0.508mm. Custom probe tips for the AutoProbe™ 300 system for in situ probe tip exchange systems. Tungsten tip with stainless steel shank, tip radius is 0.5µm with an 8-10° taper angle. Custom probe tips for the AutoProbe™ 250 systems. All-tungsten design with a 0.508mm shank diameter. The tip radius better than 0.5µm with a taper of 6° taper angle for greater precision. Ion sputter standards manufactured to the highest precision for calibrating the sputtering rate of sputter ion guns. Thin films of silicon dioxide (SiO2), tantalum pentoxide (Ta2O5) and nickel/chromium (NiCr-3) are available to calibrate the sputtering rate for different materials. Silicon wafers with thin films of silicon dioxide are available in thicknesses of 23, 50, 97 and 102.9nm. The oxide films are grown with a wet oxygen process, which ensures a higher degree of uniformity than other processes. The wafers are 102mm in diameter. Films of tantalum pentoxide (100nm) are anodically grown on 0.5mm thick tantalum foil. The standards measure 37 x 37mm. The thickness accuracy is ~5%. Consisting of 12 alternating layers: 6 layers of Cr (~53nm) and 6 layers of Ni (~64nm) for a total thickness of ~700nm with a maximum variation across the 75mm production wafer of ±2%. Standard is on a 10 x 30mm section of a polished silicon wafer. The mass density of Cr and Ni was measured using electron beam excitation and measuring characteristic X-ray intensities.